10 Things to Put in Your Children's Easter Basket Besides Candy! You are here: Home / Holidays / Easter / 10 Things to Put in Your Children’s Easter Basket Besides Candy! 10 Things to Put in Your Children’s Easter Basket Besides Candy! It’s almost time for Easter, and that means we’re on the hunt for fun items for Easter baskets. I’m trying to stay away from candy this year – since it makes my children a little crazy. Here are my best ideas for non-candy Easter basket fillers. In our area, Easter seems to be the turning point into warmer weather. It’s a tradition in our family to gift items such as bathing suits, sandals, and other summer gear. How about an Easter movie for kids? You could try An Easter Carol on for size. In my house, we can never have too many craft supplies. After you get home from Mass on Easter morning, your children can work on this Easter Egg sticker craft while you put the finishing touches on dinner. My sister gave Rachel this egg set as a Christmas gift one year, and it’s been a huge hit in my house for years! You could also look for Legos, Playdough, or even a Mister Potato Head! We add to our Easter book collection each year when the children open their Easter Baskets. Need some ideas? Here are some to get you started. How about an Easter Puzzle? You could even create more fun by opening the box, and putting each piece in a jumbo egg! Let your children get outside and enjoy the warm (hopefully) Easter morning with some bubbles. This Melissa and Doug butterfly set is on my daughter’s wish list! While the grownups are cleaning up the kitchen after Easter dinner, let the children play outside. Any little boy would love to find a dinosaur kite in their basket! They’ll be burning off energy, instead of eating chocolate! My kids love to color, and it’s a wonderful quiet activity. Load up your basket with Easter coloring books and new crayons. Try as you may, but it’s likely that your children will get some sort of candy for Easter. 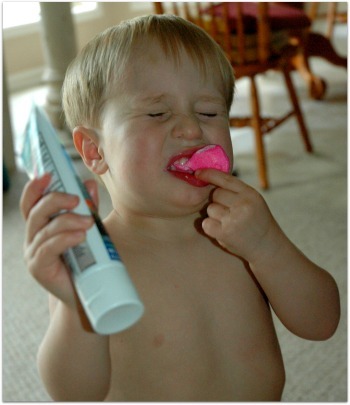 Minimize the dental damage and make brushing their teeth fun with new toothbrushes and toothpaste. My boys especially love these fun flossers. What are you putting in your children’s Easter baskets? Make sure to leave a comment and share your thoughts. This post contains affiliate links – thanks for your support! I just ordered some magnetic saint paper dolls from MagneticCatholic’s Etsy shop. So excited to stick these in the Easter baskets! That sounds like fun, Micaela! Hmm. I’ll bet you could ‘adopt’ someone for an Easter basket! I usually find a small toy, maybe a book or movie. Also like using things like fruit snacks and there is a ‘natural’ line of snacks called Annie’s(?) that are shaped as rabbits. They have fruit snacks, graham cracker bites, crackers, even a chex mix like snack mix all shaped like rabbits. Put a serving in a small baggie (found Easter themed ones). Usually only have a little bit of candy, often times one big piece, like a Reese’s egg. Oh, we love Annie’s around here — and you’re right — using those little bunny shaped snacks would be so fun for Easter! My kids are probably going to get some fun scented homemade playdough! Great list, Dianna! In Texas, we always fill ours with cascarones. Hollow eggs filled with confetti. It’s always fun to see the kids running around the backyard cracking eggs over one another’s heads. We blew eggs and filled them with birdseed last year with my friend Kaye and the kids had an absolute ball! They couldn’t wait to throw them at one another. Now I know the official name ! I like the idea of the books. Our church books have been torn to shreds and we’ve been looking for a new excuse to buy them. Books — oh, my. For the 40 Bags in 40 Days, I need to start going through some and purging them. As we’ve been reading more classics, Rachel keeps telling me she wants to save them for her children. (Little House on the Prairie, Stone Soup, Blueberries for Sal, etc.) She’s going to have some kind of hope chest! Around here, my friend and I filled the eggs with birdseed — it was a lesson in patience for the children, as well as teaching a ‘gentle’ touch. Way fun! Love your ideas! I also include things to play with outside! We live in wintery Wisconsin, so Easter also means spring is here…or close! Sandbox toys, bugcatchers, jumpropes, big bouncy ball, garden seeds to plant together, etc. Target also sells really cute bunny sippy cups!